We specialize in commercial appliance parts. When you call or email us for parts information we'll guarantee the items to be correct when model and serial numbers are provided. With a wide variety of in-stock food-service equipment parts from refrigerator door gaskets and seals to Kason's 58 series door latches and 1245 door hinges, we offer a large inventory of cold side parts. On our hotside, we supply a large selection of fryer baskets at great savings to you, infrared burners, ignition controls, and meat slicer blades all at affordable prices with a short 1 to 4 day ground delivery time on over 90% of our inventory. We provide excellent customer service and "We actually pick up the phone" imagine that. 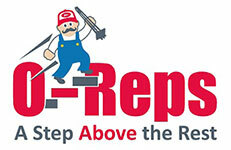 O-Reps is a small veteran-owned business competing for your business. "Our sole purpose is to give our customers great prices, great service, easy returns, and an all-around great experience." It's not about the shareholders with us we're about you the customer! We understand that while shopping online you have the ability to shop without a salesperson and you can shop for price, quality or for a friendly online experience. We hope to bring you all three. O-reps offers research as a convenience to our customers. We understand that a wrong item may be ordered so to help us help you get the correct part give us a call 888-289-5911 or email OUR sales with your information and we'll verify you have the correct part. We cannot be responsible for freight charges if you order the wrong parts. However, rest assured no matter what the issue may be we won't abandon you or leave you with a part you don't need. Parts you can expect to find in our store. ORIGINAL EQUIPMENT MANUFACTURER (OEM) PART NUMBERS ARE GIVEN AS A REFERENCE TOOL ONLY. NO INFERENCE OR IMPLICATION, BEYOND THAT OF A USEFUL REFERENCE TOOL, SHOULD BE TAKEN NOR IS INTENDED. THE PRODUCTS CONTAINED ON THIS WEBSITE ARE SELECTED BY O-REPS AS REPLACEMENT PARTS FOR THE IDENTIFIED ORIGINAL EQUIPMENT. THESE REPLACEMENT PARTS ARE NOT AUTHORIZED, SPONSORED OR ENDORSED BY THE OEM UNLESS STATED. ALL OEM NAMES MENTIONED ON THIS WEBSITE ARE REGISTERED TRADEMARKS. O-Reps.com has no affiliation with the OEM manufactures nor do we intend to imply or represent that we stock all OEM parts. We do however sell both OEM and NON-OEM parts which will be identified by the Manufacturer's name. Equipment manufacturers often don't make their parts in house but have them made by companies that specialize in manufacturing those components. OCM or Direct source parts are made by the same manufacturers as the OEM to the exact specifications as dictated by the equipment manufacturers. Aftermarket or Generic parts are made by a third party. These parts are often designed close to the equipment manufacturer's spec's with subtle differences such as color, material, or how an item may mount, mounting holes may be different these parts are OEM like or NON-OEM. UPS GROUND Price calculated with real-time rates on domestic U.S. orders. Alto shaam parts, American dish parts, American range parts, Anthony/Ardco parts, Bakers pride parts, Bally parts, Berkel parts, Beverage air parts, Blodgett parts, Bunn O Matic parts, Bus boy parts, Cecilware parts, Champion parts, Cleveland range parts, CMA dishmachine parts, Component hardware group (CHG), Continental refrigeration parts, CTX Oven parts, Cres Cor Parts, Delfield parts, Duke mfg parts, Frymaster parts, Garland parts, Globe slicer parts, Hatco parts, Holman parts, Ice-O-Matic parts, Imperial range parts, In-sink-erator parts, Jackson parts, Kairak, Kason parts, Kolpak parts, Lincoln oven parts, Magikitchn parts, Market forge parts, Merco savory parts, Middleby parts, Moyer diebel parts, Perlick parts, Pitco parts, prince castle parts, Randell parts, Rankin delux parts, Robot coupe parts, Salvajor parts, Silver king parts, Southbend parts, Toastmaster parts, Traulsen parts, True Mfg parts, U.S Range parts, Victory refrigeration parts, Vollrath parts, Vulcan hart parts, Waring parts, Waste king parts, Wells bloomfield parts, Wilbur curtis parts, Wolf range parts. We can get it! Just because you don't see what you need doesn't mean we can't get it or we don't have it. Give us a call! Providing replacement parts to: "The Food service industry, Restaurants, Bakeries, Deli's, Fastfood establishments, Institutions, Hospitals, Hotels, Grocery stores, Convenience stores, Warehouses, Cold storage facilities, and Service companies. We offer the same great prices and service to the general public." Contact us: to speak with one of our experts, please call 888-289-5911. Click Here to visit our online parts store!